When I first came down here a year and a half ago, I wasn't too fond of the place. In fact, I didn't like it. 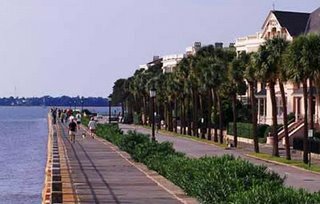 I spent my first Charleston summer either in the library, or stuck in what seemed like unending lines of cars piled up behind traffic lights. Looking back, Searcy probably spoiled me. If you don't want to deal with stop lights, then you just take any street other than Race. North Augusta was similar. There are very few stoplights or cars. Between spending too much time indoors, and spending too much time waiting behind cars, I've missed a lot of what this place has to offer. I'm not saying it's perfect, and I certainly don't plan on staying here past say.... May of 2009. But as of today, I'm resolving to learn to enjoy this city and this coast until I'm gone. Go see the over-priced possibly over-hyped hunley. Sail somewhere fun before the boat's gone. Graduate and "get outa here"
Yeah, I have a love/hate relationship with Charleston too. Having grown up there I have seen/done a lot on your list. There being few "even SLIGHTLY progressive" CoC choices there makes it very difficult. It IS a beautiful place - as long as you can be friends with the humidity. Folks here in Atlanta complain when the humidity is in the 50% range during the summer. I just laugh to myself. They have NO idea. I do hope school is going well for you. Any chance you'll make it to the SW Retreat? You should add one of those ghost tours to the list. We did one a while back and while it was a little chessy we got to see some places that we'd never discovered before. My favorite thing to do in Charleston is just park the car and start walking. I always stumble across something new. Sounds like Amber is getting tired of the dates to Taco Bell. I'm back and forth on the ghost tour. I've thought about it, but it makes me wonder if it's a little um... not a good idea. Whether or not the ghosts are real is irrelevant. You get to see some interesting places that are little "off the beaten path." And scary movies make great dates, so why not scary tours? Cheesy Ghost Tour. I'll add it to the list pending a report on Jesus and ghosts.